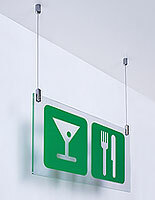 This Quality Sign Supply With Suspension Line Produces Free-Floating Advertising Effects! This Sign Supply Displays Company Promotions With Style! 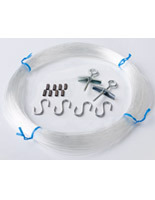 Buy Online at SignSupplies2Go.com! 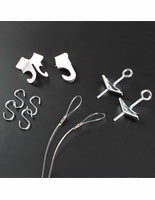 Our commercial sign supply for suspended display offers different hardware pieces for different ceilings. 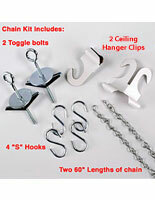 Use its hanger clips with suspended ceilings, and its toggle bolts on sheetrock or plaster and lathe ceilings. You can view this sign supply as a serious alternative to wall displays, whether in frames of cheap plastic or heavy metal. 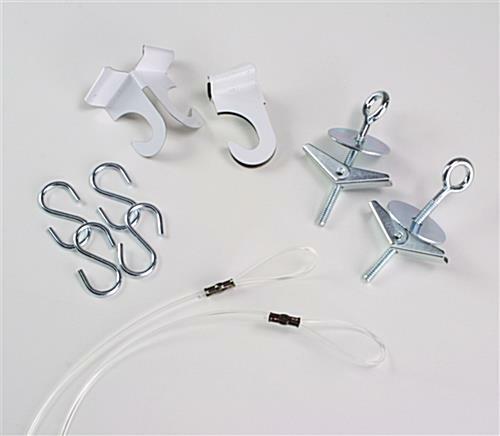 Our ceiling suspension hardware sets give you eye-catching displays that are easy to hang and to change out afterward. 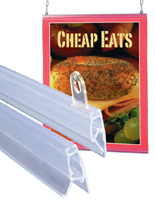 Companies increasingly favor this sign supply over wall-mount methods for an attention-getting display. An added advantage of ceiling suspension is its capacity to free up strategic floor and wall space for your other advertising and signs. Retail department stores and grocery markets prefer this sign supply for their new product advertising, and for informing their customers of special events and store layout. If you like the idea of ceiling suspension, but would need shorter or longer lines to use it at your establishment, our online store has a selection of packages with different line lengths.